RC | 2 www.cos-mag.com CONFINED SPACE Gas Detection Equipment BW Technologies by Honeywell Industrial Scientific MSA Rescue Equipment 3M Canada Dynamic Rescue Systems MSA CONSULTANTS Auditing Services Pinchin Ltd. Safety First Training Stantec Environmental Consultants Golder Pinchin Ltd. Stantec OHS Consultants EHS Partnerships Ltd. Hazmasters Inc. Levitt-Safety Ltd. CUTTING SAFETY Cutting Safety Tools OLFA® North America 9525 W. Bryn Mawr Ave., Ste. 300 Rosemont, IL, 60018 1-800-999-3436 www.olfa.com @OLFAcuts : linkedin.com/company/olfa_north_america facebook.com/OLFAcuts OLFA® offers a complete portfolio of safety solutions to protect your most valuable assets. 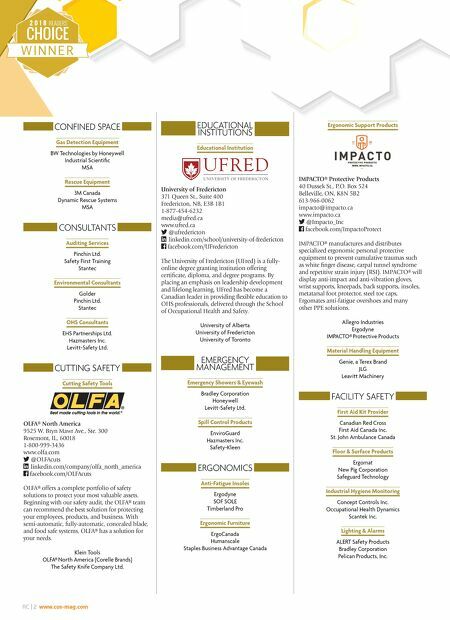 Beginning with our safety audit, the OLFA® team can recommend the best solution for protecting your employees, products, and business. With semi-automatic, fully-automatic, concealed blade, and food safe systems, OLFA® has a solution for your needs. Klein Tools OLFA® North America (Corelle Brands) The Safety Knife Company Ltd. EDUCATIONAL INSTITUTIONS Educational Institution University of Fredericton 371 Queen St., Suite 400 Fredericton, NB, E3B 1B1 1-877-454-6232 media@ufred.ca www.ufred.ca @ufredericton : linkedin.com/school/university-of-fredericton facebook.com/UFredericton The University of Fredericton (UFred) is a fully- online degree granting institution offering certificate, diploma, and degree programs. 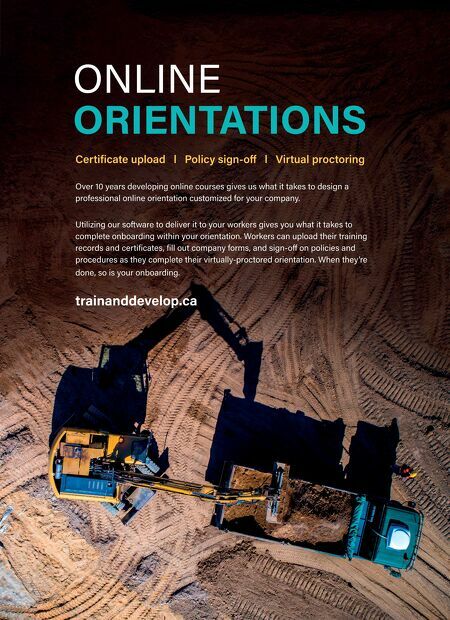 By placing an emphasis on leadership development and lifelong learning, UFred has become a Canadian leader in providing flexible education to OHS professionals, delivered through the School of Occupational Health and Safety. University of Alberta University of Fredericton University of Toronto EMERGENCY MANAGEMENT Emergency Showers & Eyewash Bradley Corporation Honeywell Levitt-Safety Ltd. Spill Control Products EnviroGuard Hazmasters Inc. Safety-Kleen ERGONOMICS Anti-Fatigue Insoles Ergodyne SOF SOLE Timberland Pro Ergonomic Furniture ErgoCanada Humanscale Staples Business Advantage Canada Ergonomic Support Products IMPACTO® Protective Products 40 Dussek St., P.O. Box 524 Belleville, ON, K8N 5B2 613-966-0062 impacto@impacto.ca www.impacto.ca @Impacto_Inc facebook.com/ImpactoProtect IMPACTO® manufactures and distributes specialized ergonomic personal protective equipment to prevent cumulative traumas such as white finger disease, carpal tunnel syndrome and repetitive strain injury (RSI). IMPACTO® will display anti-impact and anti-vibration gloves, wrist supports, kneepads, back supports, insoles, metatarsal foot protector, steel toe caps, Ergomates anti-fatigue overshoes and many other PPE solutions. Allegro Industries Ergodyne IMPACTO® Protective Products Material Handling Equipment Genie, a Terex Brand JLG Leavitt Machinery FACILITY SAFETY First Aid Kit Provider Canadian Red Cross First Aid Canada Inc. St. John Ambulance Canada Floor & Surface Products Ergomat New Pig Corporation Safeguard Technology Industrial Hygiene Monitoring Concept Controls Inc. Occupational Health Dynamics Scantek Inc. Lighting & Alarms ALERT Safety Products Bradley Corporation Pelican Products, Inc.